Welcome to San Jacinto College where we make your transition from military service to higher education a smooth transition. The Veteran Centers at Central, North and South campuses serve the men, women and families of those who have honorably served our country and assist them with reaching their educational goals by utilizing their veteran education benefits in an inclusive environment. San Jacinto College can accomodate virtually all of your academic needs with a variety of academic, vocational, and technical programs that can be funded by federal and state education benefits. 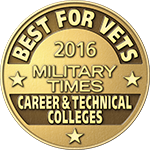 For more information about how to register for classes and apply your veteran educational benefits, visit a Veteran Center conveniently located near you. Thank you for choosing San Jacinto College, Your Goals. Your College. Job fair takes place on Tuesday, Sept. 18, from 11 a.m. to 1 p.m. inside the Interactive Learning Center, Building C1, room C1.102.